August “Auggie” Pullman has been home schooled all his life, but he surprises his parents by saying that he is ready to go to a charter middle school. 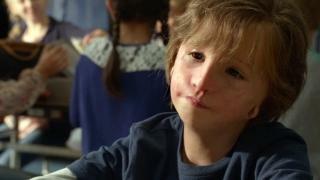 Auggie has Treacher Collins Syndrome; it has taken many surgeries to help him breathe and hear, but some facial abnormalities suggest the medical difficulties he has had in his life. His parents and his sister are worried; will the kids at school see past his physical appearance and embrace him? One fellow student, Jack Will, becomes a friend to Auggie, but when Auggie overhears Jack speaking very unkindly, their relationship seems threatened. Auggie’s older sister, Via, has not resented the fact that her parents’ lives have revolved around her younger brother; she has joined them in their care of him, and she loves him deeply, but as a high school student, she feels neglected by them, and the effect of their relative inattention to her is amplified when her longtime best friend Miranda stops returning her calls. 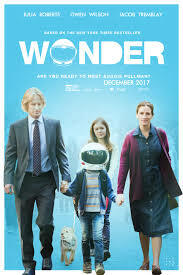 Wonder takes turns following Auggie, Jack, Via and Miranda as it explores the social and emotional experience of life for each of these young people, who each struggle in their own way. It’s a compassionate and heartwarming film which captures the kindness and cruelty of kids and adults. There is not an adoption element to the story. Many kids can relate to the other children in the film, whether it’s relating to Auggie as he is bullied, Via as she feels neglected by her parents and abandoned by her best friend, Miranda as she feels insecure and ashamed of her family circumstances, or Jack as he feels torn between doing the right thing and caving to peer pressure. Jack shows kindness to Auggie, and realizes that over time, he has come to like Auggie – he now wants to be his friend genuinely, rather than just as a kindness. Auggie’s main bully, Julian, expresses genuine remorse when he is expelled; Mr. Tushman acknowledges that Julian’s remorse is genuine. Auggie’s parents love him, and struggle to find the balance between protecting him from hardships and supporting him in the midst of them. Via’s parents and friend eventually do find a way to connect with her and help her feel supported. Via also had the memory of her grandmother’s support – her grandmother confided in her that, “your brother has lots of angels watching after him – but you’re my favorite.” It’s a memory that Via has cherished when she feels overshadowed by Auggie’s needs. I rejoiced in my heart when Jack and Auggie reconcile their friendship. Auggie’s parents and sister always have loved him. We get to rejoice along with him as he is triumphantly accepted by his teachers and peers. Several characters bully or ostracize Auggie. One is particularly cruel, and leaves a note telling Auggie to die. He has photoshopped Julian out of a class photo, and written “no freaks allowed” on it. Later, that child’s mother says that she photoshopped Auggie out of the photo because she wanted her friends to notice her son rather than Auggie. The bully was suspended, and his parents decided that he would not be returning to the school – not as a punishment to their son, but in protest of the school punishing their son at all. Auggie also overhears his only friend say that, if he looked like Auggie, he would kill himself. It takes a long time for their relationship to heal, but it does. It could be hard for some kids to see Auggie bullied or in peril. Via briefly says that she is an only child. She regrets this, and later admits this. The friend to whom she lied is understanding of her situation. The family dog dies, which could be sad for some viewers. Miranda wishes for a loving family; her own family does not pay much attention to her. She has gained a sense of belonging in the Pullman family, but over the summer she told her new friends about her life – but pretended that she had Via’s life. Now, she is ashamed and tries to avoid Via, but she misses the Pullmans. 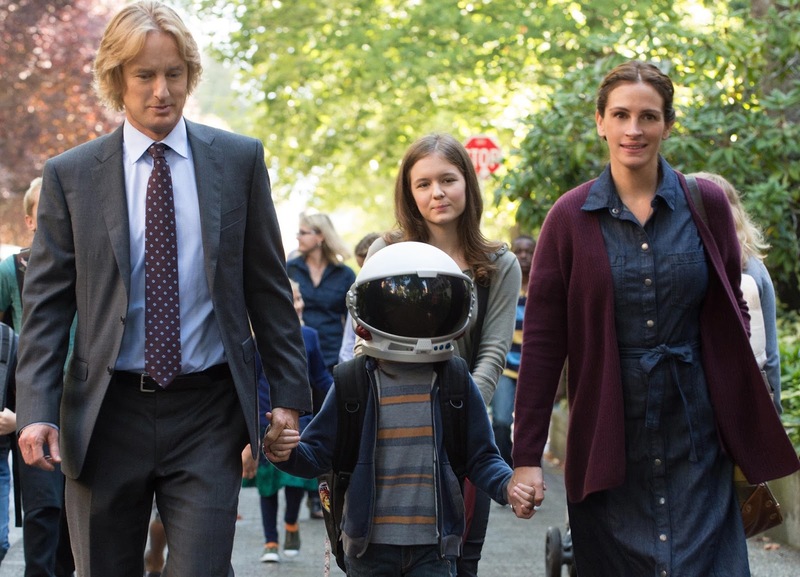 Wonder is a compassionate, thoughtful film that examines the same days through several sets of eyes. It’s much easier to view others with compassion when we understand their experiences, and Wonder accomplishes that several times over, while capturing some of humanity’s worst moments, but also some of the best. This one seems best suited to teens and their parents, although some older grade schoolers and preteens might find it worthwhile as well, if the scenes of bullying aren’t too hard. What do you think Auggie was feeling when he walked to school the first time? Why did Miranda not talk to Via for a long time? Why did she pretend to be Via? Why do you think Jack said the mean thing about Auggie? How do you think he felt when he said it? How does Via feel about her brother? Which kid do you think is most like you? Have you ever been bullied – or are you being bullied?